Today, team Tainan wrapped up our project with a presentation of findings and recommendations to Mayor Lai Ching-Te and his senior staff. We made seven recommendations on how to improve Tainan transportation through Technology, Communication, and Governance – TCG, also the acronym for Tainan City Government. Our final written report will be completed and translated in the coming weeks, but today was a very positive report-out and endorsement for our work. I found today very emotional. Three weeks in Tainan flew by. Five strangers, leaders all but not transportation experts, were picked to lend our problem-solving skills to a city looking to be “smarter.” We had over 40 meetings and 12 site visits, conducted research through on-street interviews and social media, met with leaders from Cheng Kung University and industry, and ate our way through Tainan. This morning, in just 30 minutes, we were able to distill all that down to seven bullets. There are so many people to thank, and I will never remember to name them all. Irv did a good job in his previous blog entry – to our local leaders Lisa and Anny, our travel manager Red Daddy, our professional translators Tina and Valeria, our sponsors in Tainan Mr. Chang and Ms. Hong, Mayor Lai and his leadership, IBM CGM Jennifer Hwang, our communications team, our colleagues who shadowed our project, the local IBM client leaders, … everyone was amazing. I am not sure what tomorrow will be like when I can’t head down to breakfast for some noodles and dragon fruit, don’t have a bus waiting for me, and am not saying “ho jia” (delicious) about some amazing new xiolongbao or danzai mien. 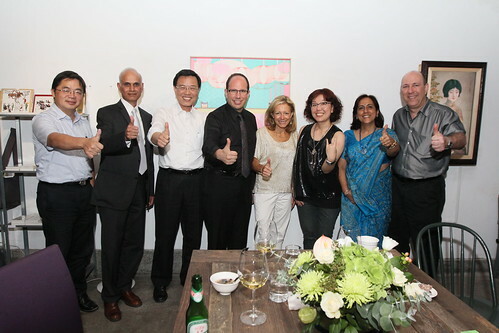 So, Xie xie – thank you – to all of team Taiwan, and see you again soon. Team Tainan has been focused this week on completing our recommendations presentation and written report, but the last 24 hours have had an unanticipated twist. We had a “typhoon break” today, in local language, due to Typhoon Matmo passing through Taiwan. A typhoon is the same weather phenomena as a hurricane or a cyclone, just called a typhoon in the western Pacific Ocean. This particular storm is a category 2, with sustained winds of 100 km/h and above. The island of Taiwan has high mountains towards its eastern side, so the winds ahead of the eye were rather light. At several points yesterday, it was hard to believe we were in the typhoon’s “red zone.” During the night, though, the wind picked up and throughout the day today, successive bands of high wind, horizontal cloud and rain, and heavy showers passed through. From our workroom on the 22nd floor of the hotel, we watched relatively quiet streets and each wave of the storm. Life went on somewhat as normal in Tainan, with many retail stores open and cars and some motorbikes on the streets. By late afternoon, the rain had stopped, just as was true almost every other wet day of the last week. The wind is still noisy up here, but at street level we walked back from dinner as we have many nights. Being confined to the hotel today gave us a lot of extra time to work on our report and presentation. We are feeling pretty good about our work heading into a readout tomorrow and our final meeting with Mayor Lai on Friday morning. Thirsty in Tainan? Have a drink, maybe of your choice. I’ve travelled all over the world – 65 countries at last count. Something that keeps me exploring is how different the world can be at times. Today, I’m writing about a trivial but fascinating difference – what the Taiwanese choose to drink and when and how they drink it. 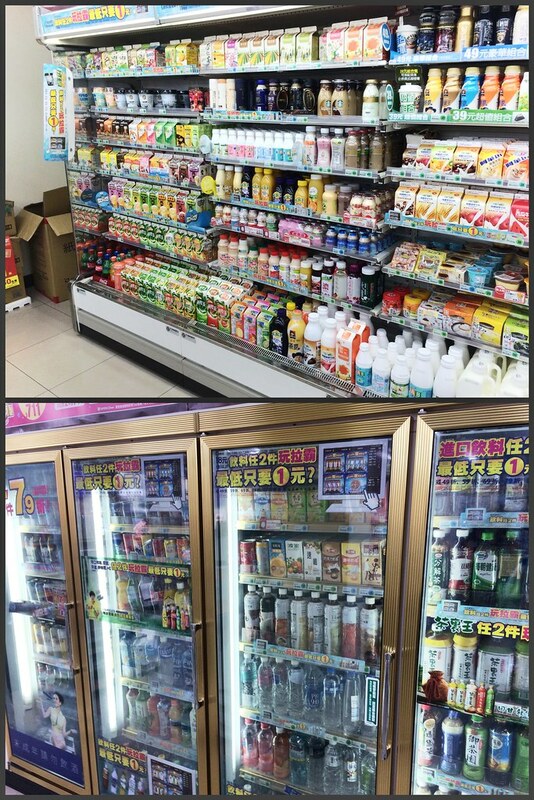 Our team has learned that beverage consumption is different in Taiwan, in several valuable lessons. 1) Coca-Cola products and other soda – rare to non-existent. Yes it’s a bad habit, but I tend to have one Diet Coke/Coke Light/Coke Zero in the morning where many normal adults choose to consume coffee. Caffeine delivery is required, and this is my choice. Here in Taiwan, I have yet to find a restaurant that serves Coke Zero or Diet Coke. Even regular Coke is pretty rare. Pepsi is non-existent. There isn’t a local equivalent like Inca Cola in Peru either. It’s just not a drink of choice here. 2) 7-11 and its competitors are ubiquitous, every few blocks in the cities…but…even they don’t major on cola or similar. It’s mostly about tea. Lots and lots of tea. Some juice, some coffee and other beverages, but mostly tea. See what’s missing in that picture? Soda pop. There might be carbonated apple juice from time to time. But mostly not. 3) What can you find besides tea? Juice. Lots of juice. Yesterday, Irv and Anjana and I had lunch in a place that served mostly tea, but also passionfruit juice. Interestingly, it was mixed to order – how much sugar you wanted and what size etc. Then, the plastic cup came out with the juice – and a sealed lid on top. Many stores have the heat-shrink plastic machines to seal their drinks. 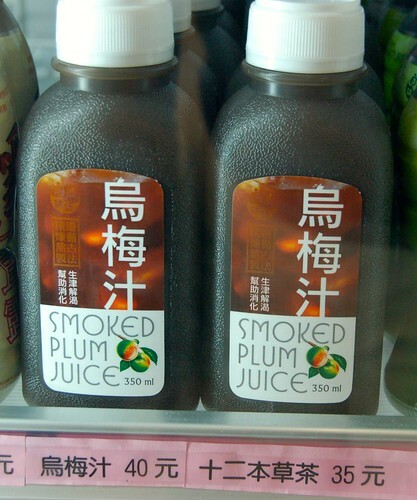 One juice we’ve had a few times is smoked plum juice. When I first saw it in the store, it didn’t sound that good. But it was served at a dinner last week, and it was really nice and refreshing. 4) We’ve also struggled with wine. Beer tends to be readily available, but wine, especially white wine, is uncommon. Perhaps it is because of refrigeration costs, but it also seems likely to have to do with local tastes. Mixed drinks are *never* consumed at a meal, only in a bar… or, in some cases, at the night market. 5) It seems like beverages in general are often considered something to be consumed after a meal. We went through a whole lunch over the weekend without anything to drink ever being placed on the table. Somehow this worked. Over the last few days, team Tainan has had several additional meetings to observe and inform. On Wednesday, we visited the Tainan Police to learn about the CCTV camera monitoring system. The police have 2-way or 4-way cameras installed at intersections throughout Tainan, which do vehicle detection and real-time monitoring. The CCTV system has a 98% accuracy rate at capturing license plates, meaning the police can recreate routes of any car or scooter in the city. The police were, as with all our meetings, very hospitable, and really helped us understand more about what infrastructure is in place in Tainan. Following the Police visit, I had the opportunity to speak to the senior staff at the Environmental Protection Bureau. They were interested in hearing more about our observations and projects that IBM has undertaken all over the world. Our dinner Wednesday night was with the economic development commission, who were extremely generous hosts. We ate in a traditional restaurant, with danzai noodles brought in by street vendor, bean jelly served up by cart, and dozens of amazing dishes on the table. The more adventurous meat-eaters among us got to sample pig’s ovaries…but there were many traditional dishes as well. On Thursday, we had the opportunity to ride the green line bus out to the suburbs. Irv Lustig will write about the “mango mania” we experienced there, but we also made other stops. Our first was to a bus transfer station, recently modernized with an air-conditioned waiting room and new restrooms. In this village, we also took a walking tour to see some baroque-style shophouses, eat street food, and visit a Japanese dojo. Our second stop was to another new bus station, where we made some local friends through “selfies” and saw another modernization. On Friday morning, we visited the T-Bike pilot station in Anping. T-Bike is a city bike program similar to the system in Paris or DIVVY in Chicago. Right now, with an “IC” card – also used on the bus – taking a bike is free. The government hopes to expand the T-Bikes throughout tourist areas of the city. Tonight we are honored to have been invited to a dinner banquet with Mayor Lai. The dress code is “sparkly” – I can’t wait to see what that means! After some weekend rest, Team Tainan was right back at it on Monday and Tuesday for additional meetings and learnings. On Monday, we visited the Department of Transportation and Communication Management Science at the National Cheng Kung University. The department has four concentrations: Transportation Management, Logistics Management, Transportation Technology, and Telecommunications Management. Some of the professors were familiar with IBM ILOG CPLEX, an IBM product for which Irv Lustig was one of the original developers over 20 years ago. The department also teaches courses in Operations Research, which is the area of Irv’s Ph.D. The Operations Research area is a core foundation for much of the research done in the 4 concentrations in the department, and Irv enjoyed discussing this topic with the chair of the department. Ed’s additional observations: Many of the University Professors have studied abroad and speak very good English. We did not have to work through our translators to understand and ask questions. After the meeting, we had a tour of the campus, which features several exceptional banyan trees and an 1880s steam locomotive. 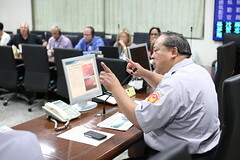 On Tuesday, we started the day at City Hall in the Traffic Control Center. We learned a lot about the information systems available to citizens for the City Bus System. After an impressive lunch nearby, we visited one of the bus companies and took our first collective bus trip on the Tainan blue line. Some regular passengers happened to board our bus, and a student sat down next to me. He was very shy around all our handlers and photographers and translators and the bus company dignitaries , but he took my business card and sent me an email later – which he admitted was the first time he ever wrote an email in English. Impressive! On Wednesday, we will begin to compile our recommendations as a group, which will initially be reviewed at the end of this week with the city government. We are at the halfway mark of our trip! We have been here in Tainan since last Sunday and things have been hectic. Today is the first day I got some free time for myself. My plan was to visit the three important temples representing Confucianism, Buddhism and Taoism. Thanks to the Tainan Tourism Service officer, I already had the maps and knew which bus to take. I augmented that knowledge with a few more suggestions from the concierge at the hotel. In particular he suggested that I buy “an all-day bus pass” since I wanted to get on/off the bus several times. He wrote “all-day pass” in Chinese on a piece of paper for me to present to the bus driver. So far so good. I walked a little from our hotel to the Tainan Train station and waited at the 88 bus stop. It wasn’t at all hard to find the right bus stop and wait there. I also found that they had LED displays of expected arrival times of different route buses. It said 6 minutes for my bus number 88. By the way, they had two displays — one in English and the other in Chinese. I thought it was pretty good. I waited for 6 minutes but the bus didn’t arrive at its scheduled time of 11:25am. it finally arrived around 11:37am. Not bad, I thought. I got into the bus and showed my Chinese slip to the driver as my concierge suggested. The driver said something. I presented more money thinking it was not enough 🙂. Then the young man behind me who I had talked to earlier said that the driver doesn’t give those all-day tickets and I had to get it from a counter at the bus stop (i.e., that’s the translation for what the driver said). I was worried that I would miss this bus and the next one was an hour later. The young man said that he would hold the bus for me. I ran to the bus stop’s ticket counter and got the all-day pass in less than a minute and got into the bus. The bus took a long time to get to the Confucius Temple. I struck a conversation with young couple (probably in their 20′s) sitting behind me, and I asked for some help. They didn’t speak much English, but the girl was more friendly and tried to help. I found out that they were visiting from Taipei and she didn’t really know the area well. She first told me that I already missed my stop but later checked with the other passengers and came back and told me that I was ok. I knew I was ok, but just wanted the local help. I took the opportunity to do my opinion survey on Tainan Buses. I asked her why she preferred to take the bus while many Taiwanese just rent a scooter and drive around. She told me that it is very hot and she prefers the air-conditioned bus! 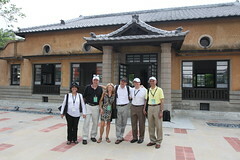 I then wanted to go to the Tiantan temple which was on the same bus route but 2-3 stops away from the Confucian temple. Since I had a good 35 minutes before the next bus 88 at 1:35pm, I decided to explore the street market opposite to the Confucian temple. It was an interesting narrow street with vendors on both sides. I bought some fruits to eat for lunch. This nice street market had trees on both sides for shade and also had overhead hoses spraying mist to keep the shoppers cool. There were many interesting things but I didn’t buy any. I then returned to the bus stop around 1:25 and waited for it. I then saw another couple that was also visiting Tainan from somewhere else. They too had gotten off 88 at this Confucian temple with me and were waiting for the next bus just as I was. In the conversation with the man, I found out that they came from Taichung by Train and wanted to tour Tainan by bus. When asked why he didn’t prefer to drive here, he said he didn’t know the city well and hence preferred public transportation. The couple looked like they were in their late forties or mid fifties. While we were talking, the time was 1:40pm and the bus hadn’t arrived. My watch moved to 2pm. No sign of bus 88. The gentleman I talked to suggested that I ask in the next store. It was a bike-renting shop. I asked if he spoke English, he said yes and when asked how far the Tiantan temple was, he said it was within walking distance and he even gave me a map. I used the map and started walking to the Tiantan temple. I overshot by a street or two and had to retrace my path. Anyway I finally got to the Tiantan temple. The problem was that the map was in Chinese and street signs pointing to the temple entrance were in Chinese. Needless to say that that caused me to overshoot and ask for help. Anyway, I learned a couple of things about ancient temples in Tainan. Sometimes they are in the middle of a block and hence not visible from any street. You just have to find the right alley that gets you there. Of course, the sign at the alley is in Chinese and if you don’t know the language here is a clue: Look for colorful balloons hung along the alley way. If you follow those balloons, you get to the temple. While getting lost and searching for Tiantan temple, I found that the Chihkan Tower (and temple) were not too far from there. So, after visiting the Tiantan temple, walking through another alley and discovering the colored balloon paths, I walked towards the Chihkan tower. On the way I saw an interesting Martial God Temple. This is apparently a temple for a hero and his ancestors. I then went to the Chihkan Tower. Even though we visited this on Friday as part of our program to meet school children, I wanted to visit this again and take some pictures. I did that and started my return journey. Luckily this time, I didn’t have to wait long. I got to the bus stop in front of Chihkan tower and wondered whether I should wait for 40 minutes for the next bus or just call it quits and take a taxi to the hotel. Luckily the bus #99 arrived in less than 5 minutes. I was very tired because of the heat and walking. I got into the bus, showed my all-day pass and sat down. I struck a conversation with a gentleman that sat next to me (he looked like a senior citizen). I asked him where he was from and he answered that he came from Taipei and he was visiting Tainan as well. I asked him why he preferred the bus. He said it is free for him (he showed me a card) and is convenient. There, another data point. Senior citizens love to travel by buses!